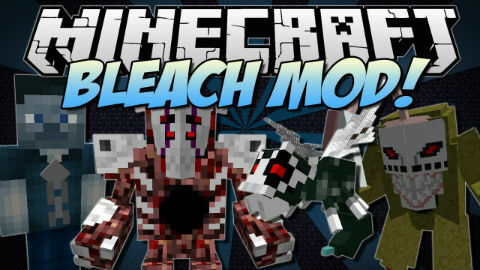 Bleach Mod is an enjoyable mod that has been designed to implement new items and mobs from the Bleach anime series into Minecraft. This mod comes with scary new mobs called the Hollows which are hostile mobs. Be careful because they will run around and attack you anytime. There is also a new block called Reiatsu with which you can craft new weapons and other blocks. Reiatsu This item is enegy dropped by Hollows and Wholes. It is used to create Reiatsu Blocks and other items in the mod. When right-clicked, the player eats the reiatsu, regaining some of their Spiritual Energy Bar if it is not full. Shinai A basic bamboo sword, used in Kendo. This sword will help you increase your spiritual energy level, but only has the strength of a wooden sword. Soul Steel Soul steel is iron imbued with spiritual energy. It is used to craft many other items. Quincy Bow Pendants made with Soul Steel and Reiatsu Blocks. There are two tiers. By right clicking with a pendant, the bow is activated. It slowly drains your energy, but the arrows require no extra energy to fire. returns to pendant with Z. The tier 2 bow fires constantly 1 shot every second the right-click is held down, but cannot shoot seeleschneiders for now. The tier 1 bow can. Mask Shards Crafted by putting any Hollow Mask on the crafting table. They are used to make a Mask that looks like Ichigos half-mask. They are also used to make Hollow Bait. Seeleschneider Crafted with two soul steel and a reiatsu block. They must be activated by right clicking to extend the blade. It takes 50 Spiritual Energy to activate it, but you at least get it back when it is shot. You have to re-activate it though. When extended, it can be used as a sword. If the player has any activated Seeleschneiders in the inventory, then they will be fired from the Quincy Bow. The Seeleschneider packs enough power that it will kill plant life as it passes, and can take out a regular Hollow in one hit. Soul Cloth Soul Cloth is crafted with a Reiatsu Block surrounded by eight Reiatsu. It is used to craft Shinigami and Quincy Robes, and Paper Walls. Shinigami Robes Shinigami Robes are crafted like normal armor, but with Soul Cloth. They take a huge amount of reiatsu to create, but they give some good perks. A full set of Shinigami Robes only protects as well as leather armor, but never wears out. Each piece also makes the Zanpakuto stronger, but the Quincy Bow less powerful. Also, Spiritual Energy is regained faster depending on how many pieces of the set you have on. Quincy Armor Quincy Robes are crafted like Shinigami Robes, but with Lapis Lazuli blocks in them. They are the same, but opposite from the Shinigami Robes, boosting the Quincy Bow and debuffing the Zanpakuto. Spiritual Energy also regains faster when you wear the robes. Hollow Tome A book about hollows. This book lets you see in game which hollows give which points. Very useful if you are trying to get a specific shikai. Reiatsu Block This is a block made of Reiatsu. It is rather durable, and gives off some light. Useful in lots of crafting recipes. Hollow Bait Hollow Bait is an interesting block, made with a mask shard and four reiatsu blocks. When it is right-clicked, the hollow bait begins spawning Hollows within a 100 block radius. And it spawns a lot. Be sure you are ready before you right-click the hollow bait, because close to 50 hollows will literally fall from the sky around you. The block despawns after being active for a few minutes. Paper Walls Pretty darn awesome, if I do say so myself. These walls give your world a more Bleachy feel, and are very useful in making awesome decorations. Made with sticks and soul cloth, which gives you 8. Hollow Ore Pretends to be a nice block of emerald, gold or diamond, until you try to mine it? Probably the most devilish idea we have come up with. Decorative Blocks These are WIP blocks that will have a use in the future. They have no crafting recipes, and do not spawn naturally. Hollows Hollows are evil spirits infesting your world. They come in many different shapes and colors. Every Hollow has a different ability, but the same basic stats. Hollows have a lot of health, do a fair amount of damage and can spot you from almost 50 blocks away. They drop reiatsu, and sometimes their masks. Killing Hollows with a zanpakuto will give you shikai points, which are necessary to go into shikai later. Wholes Wholes are peaceful biped spirits with a chain on their chest connecting them to the world. They are hunted by hollows. You can send them to Soul Society with a Konso by right clicking them with a zanpakuto. Wholes come in many different textures. Grand Fisher and Decoy The Grand Fisher is a Hollow from Bleach. He pretends to be a whole, but when you try to send the whole to Soul Society, it explodes and turns into the Grand Fisher. Sometimes you can tell if it&amp;amp;amp;amp;amp;#39;s a whole or not, but sometimes you find out too late? Note: Grand Fisher laughs creepily Menos Grande This enormous hollow is over 20 blocks tall, supposedly made up of a bunch of hollows put together. The Menos Grande is a formidable foe, having almost 200 health, and packing quite a punch. He only spawns in the Nether, or rarely when Hollow Bait is used. As the Menos Grande walks, obstacles in it&amp;amp;amp;amp;amp;#39;s path are destroyed. A Menos in a forest, for scale Small Hollows Peaceful, skittish hollows that survive off the reiatsu in the world, instead of eating people souls. Shinigami Occasionally, Shinigami will spawn. They attack hollows, and are peaceful towards you until provoked. Do not poke the shinigami with a stick. They occasionally drop nice loot, but is it worth it? Spiritual Energy When you first load up the mod, you will undoubtedly notice the bar on the right side of the screen. This is your spiritual energy bar. The bar has a cap of 50 to begin with, but will quickly increase as you use either a zanpakuto or Quincy bow. Spiritual energy is used for many different things, such as Quincy bows or Shikai, and can be replenished either naturally or by eating reiatsu. Shinigamis regain spiritual energy quicker than Quincies, but Quincies gain more from eating reiatsu. /spirit- This command is only in creative mode or with cheats. Refills your spiritual energy bar. /setspirit [50 – 1000]- This command is only in creative or with cheats. Sets your spiritual energy. /settype [fire, ice, etc.] [0-4]- Again only in creative or with cheats. Sets your zanpakuto type and texture. /setfaction [shinigami, quincy]- Useable whenever so people aren&#39;t stuck with their choice forever. Changes your faction. /resettype- Useable whenever. Resets your zanpakuto type, and all your points to 0. /resetspirit- Useable whenever. Resets your spiritual energy to 50. Just in case. Right-click to pull up this gui, and select your faction. Only works once. At the top of the screen, you will find your faction. Currently there are only two, shinigami and quincy. More will be added later, so stop whining. As of now, you can freely switch between them with the command, /setfaction [shinigami, quincy]. Both factions have different abilities. For example, Quincies cannot use zanpakutos or Shikai, while Shinigami cannot use bows. These abilities are based on your spiritual energy level, to make gameplay more exciting and to have PvP last longer. Increased Speed and Jump- Your speed and jump height increase with your spiritual energy level. There may be a way to turn this off if you really want in future updates. Flash Step- By having full robes of whatever faction you are and pressing X, you can flash step. Your character will travel 10 blocks in the direction you are looking. Increased distance by 1 block every 100 spiritual energy you have. Uses some spiritual energy, and makes cool noises. Blocking- If you have full Shinigami robes and block with your zanpakuto or Shikai, all damage taken will be taken from your spiritual energy instead, until you run out. Comparable ability will be added for Quincies soon. Player vs. Player- Basically the same as the previous, except it works for Quincies. If you are hit by another player&#39;s Quincy arrow or zanpakuto, the damage will be taken from spiritual energy. Blocking with a sword from the mod will decrease the amount taken. Shikai- Has its own section. Look down. Requirements Shinigami can go Shikai if they complete all the requirements for it, and activate it: Name your Zanpakuto- This can be done with an ordinary anvil. Name your sword whatever you want, but be warned. Once you speak to it with that name, you cannot go Shikai with a differently named sword. Unless you do /resettype. Speak with the Sword- By pressing right-click while sneaking, you can talk with your zanpakuto. This sets its name, and allows you to see what points you have accrued. Gain 400 Hollow Points- Each Hollow you kill with your zanpakuto will give you points in different categories. Each Hollow gives around 5 points in different categories. You can use the Hollow Tome to decide which ones you want to kill. The counter stops when you get to 400, and your zanpakuto&#39;s type is set in whatever category has a majority. Have over 200 Spiritual Energy- The final requirement is to have over 200 spiritual energy. But that&#39;s just the cap. You can have less if you want to activate it, but you must have reached 200 total to be allowed to go Shikai. Hold Right-Click- To activate Shikai, simply hold right-click for a while. A ring of particles should appear around you if you are able to go into Shikai. On releasing, your sword will transform and be much awesomer. Types Each zanpakuto type is different, and allows you to do many things. The different types are as follows: Fire- Your basic fire sword. Catches mobs on fire, useable as flint and steel, gives you fire resistance. Some very cool textures. Fire Bankai is where the fun will begin. Ice- This Shikai has a few cool features. Slows down mobs that you hit, and has increased damage in the snow. Also, my favorite, freezes the water underneath you for a quick getaway, or personal ice rink. Poison- Not much to be said about this one. Poisons your enemies when you hit them, but also poisons those who hit you while you have this sword out. If anyone has cool poison Shikai ideas, let&#39;s hear them. Heal- The opposite of poisoning. If you hold right-click for a while, you will get absorption if you are in a tight spot. Also heals you when your health gets low, and can revert zombies to villagers if you right-click them. Doesn&#39;t always work though? Earth- A strong sword with good knockback. Basically has increased damage and knockback, and is more powerful on land. Also looking for community input for this one. Wind- One of the most fun Shikai, in my opinion. Gives you a massive jump boost and protects you from fall damage. Hits mobs into the air, so you can juggle them if you master it. Light- Another slightly less impressive sword, sorry to say. It is much more powerful in the day time, and it gives you invisibility for a while if you hold down right-click. Dark- The opposite of light. Much more powerful at night, and gives enemies blindness when you hit them. But dark Bankai should be fun? Lightning- A mixture of Light and Wind type. Sometimes will hit enemies with lightning bolts when you hit them. For a fun time, hold down right-click for a while. Paralyzing aspect in the works. Water- A mixture of Ice and Fire type. Hold down right-click to make it rain. This sword is more powerful when you are in the rain, or in water. Allows you to swim as fast as a boat, breathe underwater, and see better underwater. One of my personal favorites. Lunar- A mixture of Light and Dark. Very WIP at the moment, so I would not suggest trying for it right now. Gives you a speed and strength boost, and fires a buggy Getsugatenshou if you right-click. Very terrain-killing Normal- If you have no majority at all, your zanpakuto will become Normal type. This means a very basic sword. Has increased damage from the zanpakuto, makes you go a bit faster and gives a bit more defense when blocking. How normal. So far, only Hueco Mundo has been added, and only in Creative mode. Shift and right-click with the Test Garganta item to go to Hueco Mundo. Still WIP. Hollow Wolf Hollow Wolves hunt in packs of 2-3. They are faster than regular hollows. Ore Hollow These hollows hide as blocks of diamond, emerald or gold. When you attempt to mine the blocks, they will turn into an Ore Hollow. Flash Step By pushing X when you have a full set of the armor on, you will teleport 10 blocks in the direction you are looking. You go 1 block farther for every 100 spiritual energy you have. Also makes cool noises. Increased Abilities The higher your spiritual energy, the faster you can run, and the higher you can jump. By blocking with a zanpakuto and having full robes, all damage taken is taken from spiritual energy until you run out. Works better against other players, but will protect you from any mob. Energy regeneration is increased, and different depending on what faction you are. Factions On spawning, the player is automatically a Shinigami. The player can switch between the two with a command, /setfaction [shinigami, quincy]. Each faction does different things. As a shinigami, you can/t use a quincy bow, but you can go into shikai, etc? You are allowed to change whenever. Download the Bleach Mod from link below.